You brush twice a day, floss daily, and you even see your dentist for professional cleanings and checkups twice per year. But despite all your efforts to make sure that your teeth will stay healthy, why is it that you are still suffering from different oral problems? This may be because you have habits that can unknowingly do a lot of damage to your teeth. Aside from putting your pearly whites at risk, these habits can actually cause your teeth to crack or chip. If you choose to continue these habits, they can even erode your teeth’s enamel, and cause receding gums. People think that toothbrushes with hard bristles are ideal when it comes to keeping teeth clean. Unfortunately, bristles that are too hard can actually cause your gums to recede and it can actually cause abrasions in your tooth root. A soft-bristled tooth brush is actually ideal for your oral health. Forcefully applying the toothbrush on your teeth can actually do more harm than good. All your teeth needs is a firm whisking that is enough to remove plaque on your teeth’s surfaces. 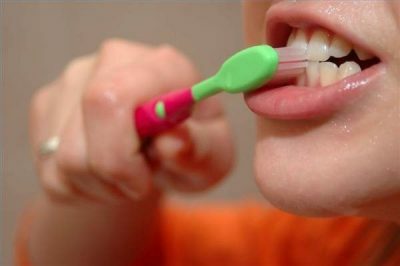 If you are not sure about how to brush your teeth properly, you can ask your dentist to show you the right techniques. Brushing twice a day is also adequate. You have to understand that if you brush your teeth more than two times per day; you might be slowly damaging it. You should also avoid brushing your teeth right after eating. This is because it can erode the tooth enamel because it has been weakened by the acids found in the foods or beverages that you recently consumed. Experts say that you should at least wait for half an hour after eating before you brush your teeth. This habit is considered damaging to your teeth simply because it exerts a parafunctional, or beyond normal bite-force. This can cause small fractures or chips to form on your teeth’s surfaces. Teeth grinding and jaw clenching can also exert excessive bite forces on your teeth. This can cause your teeth to wear out; it can also lead to fractures, jaw pain, tooth looseness, and other problematic symptoms. Since bruxism typically occurs during sleep, you can ask your dentist to help you get a mouth guard so you can protect your teeth while you rest. If blenders need special blades to crunch ice to avoid getting damaged, you should consider how much damage ice can do if you decide to crunch it with your own teeth. Chewing on ice will require forces which are more than what your teeth are designed to withstand. Teeth are designed to help you chew your food, it is not meant to rip fabric and open bottle tops. If you misuse your teeth, you have to understand that you are putting them at risk for cracks, chips, and fractures. Mouth guards are there to protect your teeth from sudden blows to the face. You need to use one before accidents happen, otherwise, you will end up losing teeth or breaking them. Dry mouth problems can cause a lot of damage to your teeth’s enamel. Saliva can help neutralize the acids in your mouth; without it, you are putting your teeth at risk for erosion and for the development of cavities. These beverages are very acidic; constantly drinking these beverages will constantly put your teeth in an acidic environment. This can hasten the deterioration of your teeth’s enamel. Sugary foods and beverages increase your risk for tooth decay simply because sugars help the harmful bacteria to thrive in your mouth. As they consume the sugars that coat your teeth, the bacteria will be able to produce more acids.